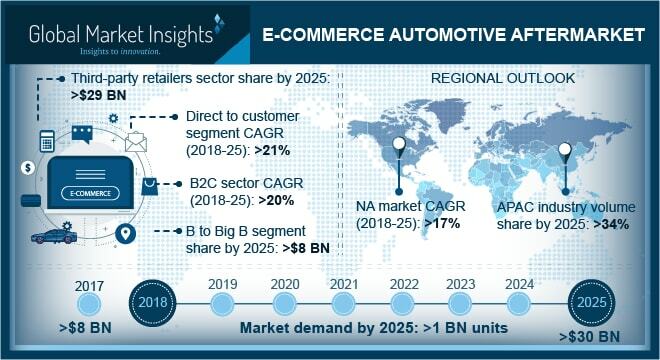 E-commerce Automotive Aftermarket size is estimated to surpass USD 30 billion by 2025; according to a new research report by Global Market Insights, Inc. Global e-commerce automotive aftermarket is expected to generate a demand of over 1 billion units till 2025. Increasing age of vehicles across the globe, specifically in developed countries coupled with shifting consumer preference towards online purchase of auto components will primarily drive the industry growth over the forecast timeframe. Changing style preferences of consumers and increasing customizations in vehicles will further strengthen the industry penetration. Steering and suspension is anticipated to dominate the e-commerce automotive aftermarket share over the forecast timeframe. This can be credited to rising demand of components such as control arms, coil springs, and bearings. Availability of numerous options at reasonable price and choice will positively impact the product demand. Spark plugs are expected to exhibit over 21% CAGR till 2025 owing to recommendation of vehicle manufacturers for product replacement after every 30,000 miles. Increased accident rates along with cheaper product availability as compared to its counterparts will further propel the segment’s growth.